Our online Grocery eCommerce software is loaded with smart features and intuitive eCommerce scripts on a super-customizable platform to make sure your customers and your online store gets benefited equally. Tailored user experience offers your online shop to get more repeated customers by selling groceries online without any hassle. Free installation and setup facility as you will be offered with extensive documentation to update changes without hassle. Fully 100% customizable as per your business model and requirements with feature-rich responsive design on latest trends. The platform is loaded with AJAX features that reducing the server load time and improves your customer journey. Save time on inventory management with pre-loaded catalogues in just one easy setup and update it easily for the future. Compatible to writing with Right to Left language like Arabic or Hebrew and offers bidirectional support on all browsers. Simplified one step checkout to help customers pay quickly with more convenient features to drive more sales and revenue. Additional extensions can be added to the modules if you want to customize and extend the functionality of the existing tools. Comes with configuration to SSL certificate. All the pages, content & transactions will have high level of security with https support. Quickly add items to shopping cart with simple drag and drop functionality reducing the number of steps with fewer clicks. We also offer solution for Grocery Clone of reputed ecommerce giants and it is built on a readymade online retail store with advanced features & user interface to boost the sales of local grocery stores! Grocery store owners can now greatly benefit from ‘Grocery Basket’ which offers a unified shopping experience by converting their offline store into online shopping platform with this BigBasket like website. 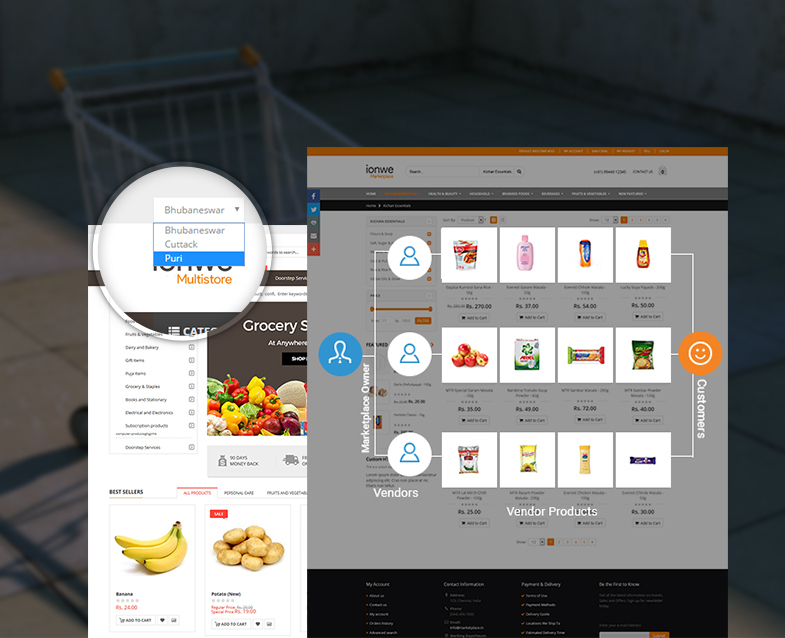 Grocery storefronts, local departmental stores, and supermarkets can easily list their products on this fully featured grocery ecommerce platform and receive bulk orders from customers in order to increase their revenue and yield more profit at a very low investment! Skyrocket your local ecommerce business to great extents with our ZopNow and BigBasket Clone Script!! Magento is one of the most popular eCommerce platforms on the web today and is being used by around 240,000+ merchants worldwide. 34% of Alexa 1 Million Top Sites uses Magento development as their eCommerce software platform to build their online shopping websites. Magento eCommerce is a great fit to your grocery online store and the list of features in Magento continues to grow at a pace that is also easily upgradable overtime! 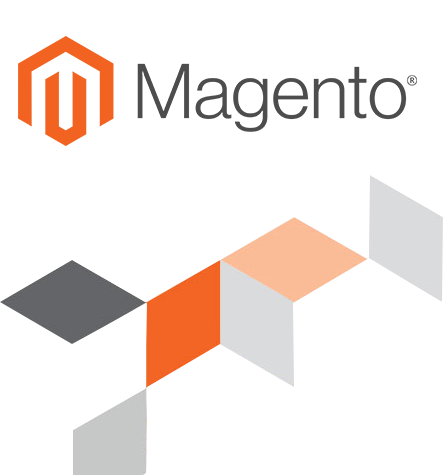 Flexibility, scalability, affordability and dependability are the four main reasons to choose Magento! 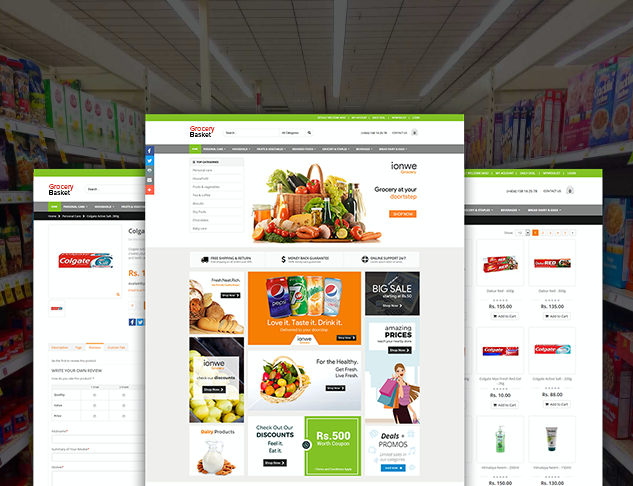 Looking for a customized online grocery supermarket website? We also offer a multi-vendor marketplace for grocery eCommerce stores, who wish to transform their small business into the leading online marketplace and earn commission from multiple sellers. It is a comprehensive B2B and B2C platform with feature-rich marketplace functionalities to reach out far and wider customer base while offering one stop solution to multiple sellers. Take advantage of the advanced online grocery business model like multi-site or multi-store features if you want to control multiple stores of different geographical limits all on a single administration. Sell more with mobile commerce! Get Hybrid mobile apps for your grocery eCommerce store and boost your mCommerce presence. Our grocery eCommerce mobile application for Android & iOS devices works in-sync with your web store where customers can shop right from their Smartphones & place their orders on the go. Why should I prefer your platform to build my online grocery store? When it comes to developing a fully customizable eCommerce online store with full support and an everlasting commitment for all your website needs, we are here to help you build your grocery ecommerce store to sell your stuffs in an easy way. And, our grocery ecommerce software comes with 100% customizable feature which can be modified whenever it is required. What do I need to do to set up my grocery eCommerce website? To setup your grocery online store, you just want to choose a plan and post your requirement. We will get back to you to discuss further about your requirement and based on that you will be handed-over with a full-featured grocery eCommerce website with pre-loaded inventory which can be customized and updated by you in the future. How does your platform improve the performance of my web store in search engine? To improve your ecommerce grocery shopping store’s SEO, we have in-built configurations that can give space for using Meta data and keyword optimized content that helps your website to get ranked in search engines making it easy for your customer to find you. All our ecommerce platforms are built with best in-class search engine optimization practices for better search indexing and ranking. How many groceries can I add to my online supermarket website? Absolutely no limitations! You can add unlimited number of products to your grocery online shopping cart website and manage your inventories through effective site management. Adding multiple products to different categories can help your store visitors to browse through products with a hassle-free shopping experience. Do you have people to help me with installation and setup my online grocery supermarket? Yes, we use Magento ecommerce grocery platform with unique website design to customize your requirements and install it on your website with all pre-loaded features to setup your website completely. We will also give you all the documentation required to use the platform by yourself in the future, if you are in need of adding products or customizing the store for your specific needs. Can I upgrade my online grocery store in the future? Yes, the website is completely upgradable. Your online grocery supermarket will be pre-loaded with readymade extensions that can be updated on a frequent basis. In future, if you want to include additional features or revolutionize your grocery online shopping cart, you may opt for a high-tech upgrade to make your food and beverage shopping store more convenient to your customers. Do you create a website similar to the online supermarket BigBasket to sell groceries? Yes, we do offer bigbasket clone script with ultimate features that helps you start your very own BigBasket like online grocery store. On purchasing our grocery delivery script, you will be given with fully encrypted source code so you can anything you throw its way. You may also request a live demo access by clicking the Request a Free Demo button at the top menu.